As you know by now, I’m kind off serious about coffee and don’t believe in compromising on taste and quality just to get a coffee “fix”. So, as I cannot take my 14 KG espresso machine with me together with grinder, tamper, etc, when I travel, the second best thing for me is drinking filter coffee, with freshly roasted coffee beans of course. So you can imagine that I must have been really excited when I discovered a plastic cafetiere mug ideal for travelling with and made by Bodum – I’m not getting paid by them for this, but if you know anyone who works for them, send them a link to my website, so that they can at least think about it. In any case, here’s a picture below of this wonderful invention, taken on my last trip to Zambia in southern Africa. I usually take this with me when going to places where it might be difficult to get a decent cup of coffee. For Zambia, this might sound strange as their crop of arabica beans can be found easily in most European or American speciality stores (Starbucks sells them on the internet), but sadly, they tend to export all the good stuff and so it is difficult to get well roasted coffee beans in Zambia. 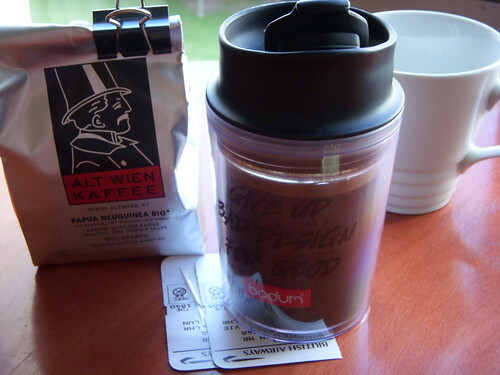 The travel mug is a good size and it is enough for two small cups or one mug and quite light and simple to use. It cost me about 5 Euros (or $7 in today’s bad dollar exchange days). Recommended for your collection when you travel to those places where it might be difficult to get your regular dose of quality coffee to drink. This entry was posted on Wednesday, February 13th, 2008 at 6:13 pm	and posted in Thoughts. You can follow any responses to this entry through the RSS 2.0 feed. « Latte with Fries ?